Rotary-Planetary-Tilting stage with variable speed, adjustable tilt and 4 specimen holders ensures uniform coating on multiple samples. The Rotary-Tilting stage is specifically designed for TEM and analytical applications and holds either 25 x 75mm (1" x 3") glass slide, 7 standard 12.7mm pin stubs or 3 sample holders. Both stages are mounted on a mounting collar and can be readily implemented in the chamber. 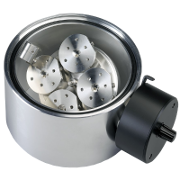 This High Vacuum Turbo Carbon Coater offers high quality carbon coating techniques for TEM, STEM, SEM, EDS/WDS, EBSD and microprobe applications. The compact, turbo pumped system requires only a standard power outlet and occupies minimal bench top space. The practical chamber size of 150mm diameter allows for rapid pump down and coating cycle times of around 10 minutes. The use of ultra purity carbon rods in a high vacuum chamber gives the high quality coating needed for critical TEM, EBSD, high resolution SEM and microprobe work. The modular design permits rapid change between a variety of applications with optimized conditions. 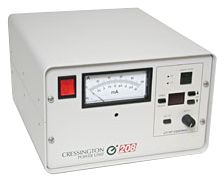 This coater uses a unique fully integrated electronic feedback-controlled power design for the rod fed Bradley type carbon evaporation source. Current and voltage are monitored by sensor wires in the evaporation head where the evaporation source is part of the feedback loop. This feature gives the conventional rod fed carbon source unusual stability and reproducibility. The carbon source uses two-step ultra pure carbon rods. 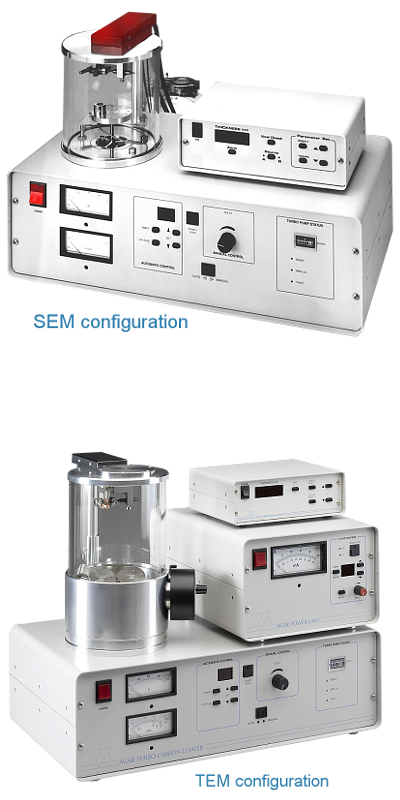 The evaporation source can be operated in manual "pulse" or manual "continuous" modes. The pulsed mode, when used in conjunction with the optional high resolution thickness monitor, gives absolute control over the desired thickness of the carbon coating. The automatic mode lets the user set the voltage and time, which together with the two-step rods gives consistent coating combined with ease of operation. The automatic mode lets the user set the voltage and time, which together with the two-step rods gives consistent coating combined with ease of operation. The unique optional HIGH-VAC / LOW-VAC pressure adjustment system utilizes a precision needle valve. HIGH-VAC is used for highest quality carbon films such as for TEM applications. LOW-VAC is used for Glow Discharge cleaning of TEM grids. For SEM, EDS/WDS and microprobe analysis applications, the Rotary-Planetary-Tilting stage with variable speed, adjustable tilt and 4 specimen holders ensures uniform coating on multiple samples. The Rotary-Tilting stage is specifically designed for TEM and analytical applications and holds either 25 x 75mm (1" x 3") glass slide, 7 standard 12.7mm pin stubs or 3 sample holders. Both stages are mounted on a mounting collar and can be readily implemented in the chamber. The modular design of permits easy addition of optional coating accessories often used in EM labs such as metal evaporation, glow discharge and aperture cleaning devices. The accessories are all driven from the sophisticated Auxiliary Power Unit. The accessories are connected to the APU by means of a "smart" cable. The APU detects the device and enables the controls accordingly for ease of operation. The APU contains a digital timer and digital HT/LT controls for the accessories. The coater and all accessories have integrated vacuum safety switches so that the unit can only be used under vacuum.